One of my pet projects has become adding solar-powered lighting to our property. My goal is to increase security, ambiance, and safety around our property without having to extend power or add to our electric bill. On more than one occasion I’ve walked into a raised water faucet in the yard at night on my way to a shed (the last time this happened I went to Lowe’s the next day and bought a solar spotlight for that area). I wanted to add a motion-activated light to our carport to provide a little more security around the cars and to illuminate the area better when we return home after dark (some light from the back porch bleeds over but it’s not always on and the carport wall blocks much of it). Since we don’t have power run out there I started looking at solar-powered options and settled on the MAXSA Innovations 40218. Overall, reviews seemed positive and since I wasn’t lighting a particularly large area I wasn’t too concerned if the LEDs turned out to not be especially bright. Last weekend I installed it. 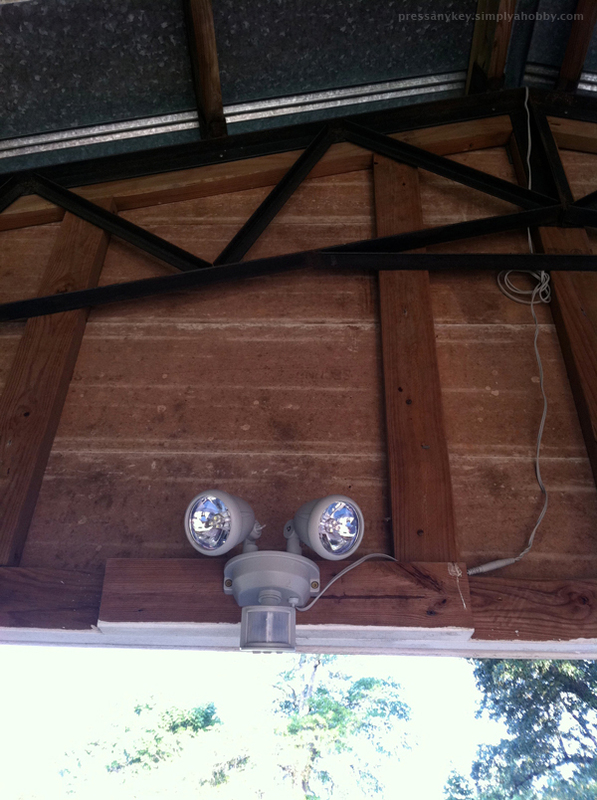 The light/motion detector assembly is inside the carport and the solar panel was easily installed on the outside edge of the roof (thanks to a 9′ cable that came with it). So far I’ve been impressed with the light output. It’s not brilliant, but it does a good job of covering the carport, especially the areas near the lights. The motion detector reaches just to the edge of the carport when set near maximum sensitivity. It’s currently mounted on the lower edge of the carport wall, where it’s within reach. I may move it up higher so anyone goofing around the carport can’t turn it off as easily, while I could still adjust simply enough with a ladder. It’s also not centered, which is a minor issue but it would probably look better if installed a board up higher to mount it near the center. I’ll also need to point the sensor down a bit more. Currently, it doesn’t detect motion that’s very close to the light and almost beneath it. Updated 11/27/2011: For several months the light worked just as well as when it was new. About two weeks ago I noticed that it wasn’t working. Finally, about a week ago I replaced the rechargeable batteries with a set of Eneloop AAs that I recently purchased. So far it’s working. I’ll monitor the light to ensure that it’s actually recharging the batteries and not just operating off the original charge in the new batteries. If it stops working then I’ll check the solar panel and see if it’s dirty. Updated 04/11/2012: Replacing the batteries didn’t solve the problem but the cause appears to have been exactly what I thought it would be. The solar panel was dirty. I think it was covered with dust and pollen along with a little bit of bird crap. I changed the tilt of the panel to its steepest setting (it was sitting flat with the hope that it would catch more sun) and then shot the hose up at it to clean it off. It seems to be working properly once again. Updated 01/03/2012: Once again, I had to replace the batteries to get this light working in the winter. I installed a different solar powered motion light on my shed and I’m considering replacing this one with that model. Updated 07/28/2013: This thing can’t seem to keep the batteries alive through a winter and barely manages to work with a fresh set. I haven’t even bothered to replace the batteries this season. At the moment it’s little more than an ornament. I’ll probably just remove it and toss into our pile of items for a yard sale. The other solar light I purchased is still working great and a similar model will likely replace this one.